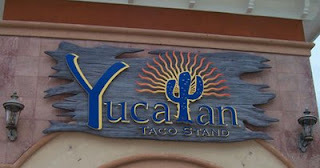 We ate at Yucatan last night, and we were not impressed with the food. The place was nice, but the food was less than outstanding. The house magaritas were not very good, and tasted like cheap tequlia even though they claimed to be 1800. They were out of Presidente, and when they brought a Dos Equis Amber, it was miller lite, served in a plastic cup, claiming no glass allowed outside. She went back to get the bottle and returned with a different dark beer, since they were out of Dos Equis, in a cup with a bottle. They are new, and one of the owners talked with us, and repeatedly said they are still trying to get their feet. I hope it will improve. They have a good location and have spent a lot of money to make a nice place.